One variety of subterranean termites, which presently cause a great deal of damage in the southern United States are the Formosan termites. These termites came from Eastern Asia, but they have transplanted and spread to many parts of the world including the U.S.
A large territory from one colony. Infestation of many kinds of structures. Many of the most severe termite challenges in our country, especially in the southern states, result from these pesky immigrants and their descendants. Now that they are well established, these insects are much faster at multiplying and are taking a greater toll than the native subterranean termites. Where did the Formosan Termites Come From? Formosan termites appear to have invaded the USA at the end of World War II when pallets and boxes brought supplies from the Far East to the Atlantic and Gulf ports. It wasn’t until the 1960s that they were first noticed, but by that time they were wide spread in most of the southern states. Now they cause an estimated $1 billion $2 billion in property damage every year, and their cost to the economy is growing. New Orleans is one area that has been particularly hard hit by the Formosan termite infestation. Much of the old quarter of New Orleans is wood, and to these new termites it’s a huge feeding ground. Formosan termite populations in New Orleans has literally exploded, these bugs are spreading so fast. The problem is so bad that they are calling it the second battle for New Orleans. One reason Formosan termites were so widespread before their threat was recognized is that they work very much like native subterranean termites. Like the native subterranean termites, the Formosan variety are generally found living in the moist soil near a ready supply of wood. However, Formosan termites from a single colony may have a range of as much as an acre of ground. Several wooden targets, buildings and trees can be attacked from the location of one colony. Trying to protect any single object is not effective; an area protection program is necessary. It took years before huge nests were built up in the Gulf Coast areas. These nests of Formosan termites are much larger than those of the native termites, almost always in the millions of insects. Only when they get their large colonies do they have the force necessary to destroy a structure rapidly. It is difficult to distinguish these two types of subterranean termites in casual observation. The native kind of termite soldiers have rectangular heads, the skin of which is scloterized (hardened) and with prominent mandibles, while the Formosan termite soldiers have heads that are dark, a little larger, and oval shaped. This difference between the soldiers is one of the easiest ways to make the distinction. Of course, the huge nests and the wide-ranging and massive destruction caused by Formosan termites makes it easy to distinguish them after the damage is done. The two types are similar in that a Queen and a King will begin a colony slowly. After a few batches of eggs, there will be enough workers that the Queen can devote herself totally to laying eggs, eventually several thousand per day. Both types have workers constituting the majority of the colony and these far-ranging little creatures can bring home all the food that is required by the King, the Queen, and her growing progeny. Life spans are several years and if the King or the Queen is lost, new winged and wingless alates develop to take over the responsibility of fertilizing and laying the eggs right there in the nest. 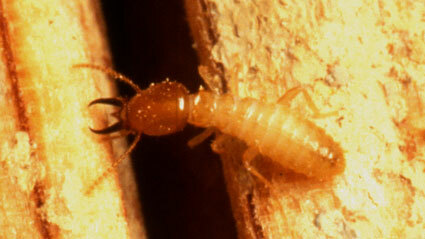 As with the native subterranean termites, the Formosan termites require water and wood. The warm, humid, rainy states along the Gulf and the Atlantic coasts give a perfect setting for the growth and spread of this group of insects. Observers are constantly amazed at the ways in which they find cracks in the concrete and other barriers in order to get to where they can satisfy these needs. One scenario for introducing Formosan termites into your home is to buy decorative railroad ties, the kind that are not too rotten, but no longer useful to the railroad. You put these ties in a place to retain the soil where you will grow flowers that need frequent watering. 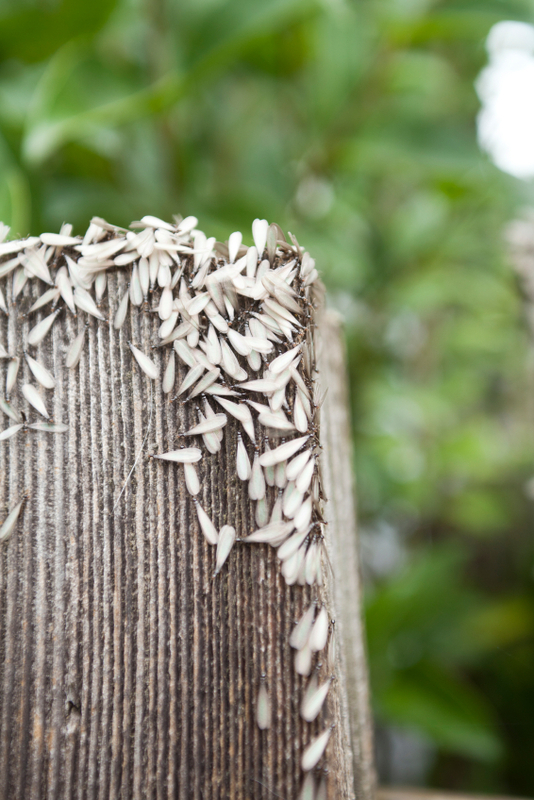 If Formosan termites could speak English, you would be at the top of their “three cheers” list. 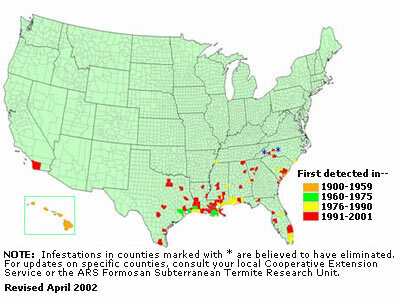 How Far Has the Formosan Termite Spread in the US? The Formosan termite can only live in warm areas. Their eggs will not hatch unless the temperature is above 68 degrees F. (20 degrees C.). This restricts their spread to the southern United states, pretty much anything south of 35 degrees latitude. In the U.S. 14 states now have Formosan infestations: Alabama, California, Florida, Georgia, Hawaii, Louisiana, Mississippi, North Carolina, South Carolina, Texas with outbreaks in Arizona, New Mexico, Virginia, and Tennessee. Like normal subterranean termites, Formosan termites spread though swarming. Aside from swarming they can also spread by infesting utility poles. When the poles are removed or changed out they spread to where the utility poles are discarded. The aggressive and damaging results of Formosan subterranean termites has activated many efforts to limit their spread and establishment. 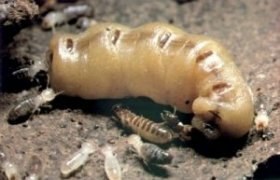 Standard termite treatment methods have not been as effective with the Formosan termite. Simple area ground treatment has not been as effective as desired. A lot of research is going into the development of different treatment methods of dealing with Formosan termites. Termite staking is one strategy for eradication is to plant a stick of wood where the termites can come and develop a path and an appetite. Then You replace that wooden bait with some paper-like material that is doped with a slow working poison. The idea is to get the visiting workers to carry the poison in their stomachs back to the nest where it can infect the whole colony.